Mission Brewery produces a solid line up of core beers, their Hefeweizen is quite good, and all of their other beers can hold their own fairly well in my opinion. But when a brewery only makes the same five beers us beer geeks can get a little bored. 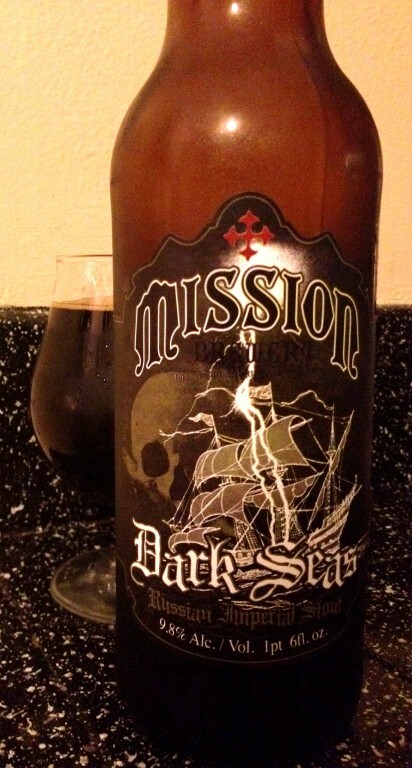 Because of that I was pretty excited when they announced Dark Seas a Russian Imperial Stout a few months back. Unfortunately after trying it I think I’ll opt for a Hefeweizen next time I’m at Mission. Dark Seas isn’t a bad beer, it’s just not for me. And when there are so many amazing Imperial Stouts we have access to here in San Diego, why drink one you’re not blown away by? My biggest complaint about Dark Seas was the sweetness, it just didn’t feel like there was much hop bitterness to balance out the sweeter malts. Caramel, toffee and a sweet roastiness all came to mind as I drank it. There’s a long and lingering roasted, almost burnt tasting bitterness from the roasted malt that leaves a bad impression after every sip. It felt low bodied and thin, fairly lacking for what I thought would be a fairly robust drinking stout. I will say that I typically like my Imperial Stouts with a big hop kick, so if you don’t you may want to give Dark Seas a chance. I just couldn’t get over the sweet roastiness of it. Homebrewers: get your best beers ready, a few local beer businesses are hosting homebrew competitions and beer and recipe swaps in the coming weeks. First up is Escondido’s Holiday Wine Cellar’s 3rd Annual Homebrew Competition. You might remember last year’s winner, Indra Kunindra Curry Export Stout, which was brewed by Ballast Point and led to homebrewer Alex Tweet landing a job at the brewery. For this year’s winner will be brewedin collaboration with Iron Fist Brewing Company. There’s no entry fee, homebrewers are limited to three entries each and entries must be in by January 30th. So if you’ve got something good ready to go, read all the details here. Next up is Bottlecraft’s homebrew share and recipe swap. This one isn’t a formal competition, just a friendly bottle share and recipe swap. There’s no charge, just bring some homebrew and recipes to share. It’s happening Wednesday February 15th at 7pm. Check Bottlecraft’s Facebook page for more info as the date nears. Last but not least, Monkey Paw is hosting their first ever homebrew competition in February. Monkey Paw’s head brewer Derek Freese got his start as a homebrewer (in fact Monkey Paw is his first pro brewing gig). Entries are free and each brewer can enter two different beers. Beers must be delivered to Monkey Paw by February 24th. The winning entry will be brewed at Monkey Paw, check here for all the details. 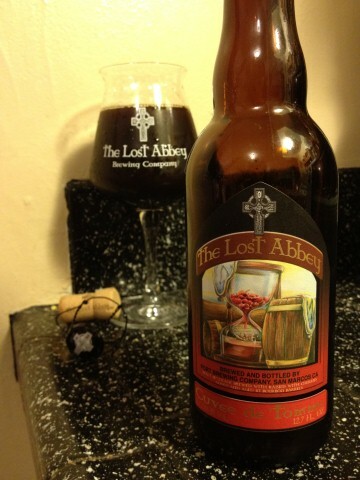 The Lost Abbey’s Cuvee de Tomme isn’t cheap, but if you like sour beer it’s worth it. Cuvee de Tomme starts it’s life as another Lost Abbey beer, Judgement Day, but goes through a year long journey to become the final product. The most recent batch of Cuvee de Tomme was released on Christmas Eve, so this is the 2011 batch that is on store shelves now. The previous year, the 2010 batch was underwhelming and wasn’t nearly as good as the year before that, 2009. But thankfully this 2011 batch is much better than 2010 in my opinion and is as good as I remember 2009 being. As the bottle notes: “… each batch of Cuvee will vary slightly between bottlings” and there are a ton of things that can contribute to the flavors between years. I was a little worried when I opened the bottle and poured and there was almost no sign of carbonation, but thankfully there was just a bit of bubbles hiding in there, what seemed like the perfect amount. Cuvee de Tomme is pretty sour, it smells of juicy sour cherries and tastes the same upon first sip. There’s plenty of woody oak flavor in there as well. I’m not much of a wine drinker but this reminds me of red wine, maybe it’s those “supple tannins” the label refers to. At 11% ABV Cuvee de Tomme is very much a sipper and could take a good hour or two to finish, which isn’t a bad thing as the flavors really open up as it warms up. Don’t drink this one cold. If you like sour beers I highly recommend Cuvee de Tomme. $17 for 375ml is pricey, it’s not an everyday beer, but worth it when you find the right time to open it. If you’re not much into sour beers, or don’t have much experience with them, this might not be the best to start with. Though picking up a bottle now while you can still find it on store shelves and saving it for a while isn’t a bad idea. If you read this this blog regularly you may have noticed I haven’t been posting much. After the holidays things got extremely busy at the day job. While working ten, twelve and even sixteen hour days there wasn’t much time to focus on beer. Lucky for me things seem to be slowing down now. But it was last week, after one of those ten hour days that I decided I needed a beer. I stopped into Bottlecraft after work looking with nothing specific in mind but had a few ideas about what I was looking for: hops, a reasonable price, and something I hadn’t had in a while. 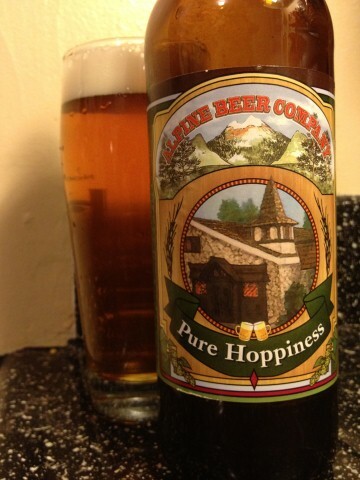 Without knowing it before hand, Alpine Beer Co.’s Pure Hoppiness was exactly what I was looking for at $8 for a 22oz bomber. I’m a big fan of Alpine’s beers, especially their IPAs, but for some reason I haven’t had Pure Hoppiness in awhile (I tend to find myself drinking the lower ABV beers, Hoppy Birthday and New Millennium, or the extreme triple IPA Exponential Hoppiness when I’m drinking Alpine). All sorts of hop aromas fill the air as soon as you start pouring: citrus, pine and that hop smell that’s often described as “tropical fruit” that I can never quite put my finger on which fruit that might be (mango if I had to guess). For a big hoppy beer Pure Hoppiness is less bitter than one might expect, but with plenty of great hop flavor, pine and citrus standing out to me the most. There’s a tiny bit of sweetness, very light tasting, almost like honey. San Diego has plenty of choices for hop heads, and Pure Hoppiness stands out among the best. Alpine’s beers have always been pretty easy to get at the brewery and it seems to me like there’s been a bit of an uptick in distribution over the last year or two. Alpine is planning a pretty big expansion, so we may start seeing more of their beer out and about when that happens. Mikkeller isn’t so much a brewery, but rather a gypsy brewer. Mikkel Borg Bjergsø travels around the world and brews beer under the Mikkeller label in various breweries, mostly in Europe. If you’re familiar with Mikkeller you’d probably agree that they put out some fine beers, but one drawback to buying European beer is that it often isn’t as fresh as it should be when it gets down here to San Diego. That isn’t always a problem, Mikkeller makes some fine stouts and other beers where freshness isn’t crucial, but for the most part I’ve long avoided their IPAs, having felt I payed too much money for a stale IPA that unbeknownst to me had been sitting on a shelf (of even in a distributors warehouse) and was a shadow of what it once. Because of that I was pretty excited to hear that Mikkeller has teamed up with Drake’s Brewing up in the Bay Area to brew some of his beers for the US market. For us down here in San Diego this will help immensely with the freshness aspect. Chances are also good the price points could be a bit better as well since the beers don’t have to be shipped nearly as far. Invasion IPA didn’t blow me away, it’s a sold IPA, but far from the best I’ve ever had (though I wouldn’t hesitate to drink it again). At $7 or $8 for a 22oz I felt it was a fair price, a bit higher than many of San Diego’s best IPAs, but much easier on the wallet than European-made Mikkeller beers tend to be. 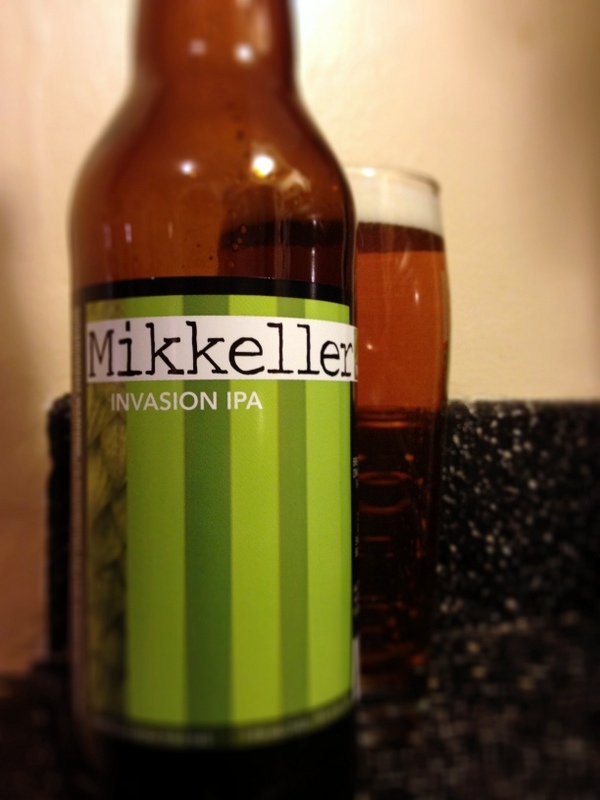 Hopefully we start to see more US brewed Mikkeller beers showing up, especially the IPAs.